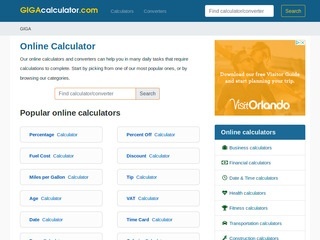 A big online collection of calculators and converters for all kind of daily tasks. Mathematical, geometric, financial, health, transportation, construction, date & time, statistical, and many other types of calculators. Converters for data units, dimensions and distances. Easy conversion from metric to imperial and imperial to metric units. Most tools have extensive references describing the data they were built on, and formulas explaining the calculation.